Attention iPhone, iPad or iPod Touch users: Apple released an important iOS update for the Spectre and Meltdown vulnerabilities that you need to get now. The year 2017 ended on a brutal note for Apple in regards to security. The iPhone maker has always prided itself on its sterling track record on security. But security flaws showed up in the latest version of its desktop operating system, macOS High Sierra, version 10.13 in late November 2017. While that’s behind us, last week’s controlled reveal of the Spectre and Meltdown security flaws, which were originally thought to have affected only Intel processors, have expanded in reach to even Apple’s A-series CPUs. Today, Apple released a major update with a fix for all supported iOS devices affected by the Spectre and Meltdown vulnerabilities. While iOS updates are known for the usual bug fixes, performance and feature improvements, this release is one you probably want to do your utmost best to download as soon as possible. Spectre and Meltdown are severe vulnerabilities that affect how the brains of your iOS device execute code. This hole opens up your device making it possible for hackers to access sensitive information such as passwords, pictures, and banking information. 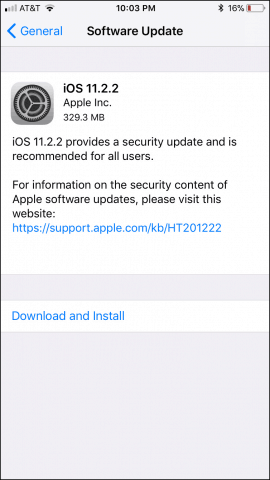 The iOS 11.2.2 update is just 64 MBs and is available for devices such as the iPhone 5s and later, iPad Air and later, and iPod touch 6th generation. Users can download the update by connecting to a wireless network, launch Settings > General > Software Update then tap Download and install. The update specifically targets Spectre and Meltdown, so, no additional surprises there. Apple’s other devices such as Apple Watch and Apple TV are not affected by this flaw. If you use a Mac, there is also a Spectre update for your system. Usually, at this point in the article, we ask whether you should upgrade now or wait it out a bit. But this time around, we recommend you jump on this update right away. You might want to make a quick backup just in case something bad happens. Last month, while attempting to install 11.2.1, I experienced some issues on my iPhone 6s. The update failed a couple times during installation but automatically recovered. It has been revealed that Apple started mitigating the Meltdown attack in 11.2. This might have been the contributing factor to the long time it took to install – just speculating of course. Although Apple and other software firms and Internet companies were aware of the problem as far back as summer 2016, it was eventually leaked out. There is a possibility that hackers might be trying to cook up something quickly to cause damage, especially for high profile platforms such as iOS and Windows. So, grab this update as soon as you can and report back in the comments your experience with the update. I heard rumors that metldown / spectre fixes would slow down CPUs. With this and the battery throttling, can my iPhone 6S get any slower? No. The average consumer device will not be affected negatively. Spectre/Meltdown is a problem that exists in the architecture of microprocessors … all of them … AMD, Intel, ARM. It is an issue that has existed for 20 years. At the time I write this, there are no known imminent threats out in the wild. It’s something that consumer should be aware of, like all exploits, and it’s important to make sure your devices are updated. However, this will not slow down your modern phone Mac or PC. However, there have been issues with older AMD systems but Microsoft has since pulled that buggy patch. It can affect the performance of servers in big data centers. Because the fix is to disable the prediction power in microprocessors. So, the people that need to be most concerned about this are the big cloud companies like Amazon’s EC2 and Microsoft’s Azure since they run multiple virtual servers on the same physical server. Below is what the Executive VP of Windows and Devices is saying. Not good for older devices…. I have a Toshiba Satellite Laptop. So far no bios update from Toshiba. Anyone know of Toshiba’s plans? Given that it has been around so long. my iPhone 5 will not take this 11.2.2. It is stuck at 10.3.3. So what can I do to protect myself.